The storm surges of yesterday created wide-spread flooding all along the east coast of England. Last night the villagers of Kilnsea, a village on the edge of the Holderness coast near Spurn Head, were advised to evacuate their homes. Kilnsea, low-lying, exposed to the elements and manna to a hungry North Sea was, according to the Domesday Book, originally established on a hill and an inland village some distance from the sea. Later descriptions tell us of a scattering of cottages with gardens clustered around the Medieval church. On the village green stood a large stone cross originally taken from the ancient and lost town of Ravenser. It had been erected there to commemorate the landing of Henry VI in 1399 but was removed to Kilnsea when the sea took that town. Eventually though, the sea worked its mischief in Kilnsea and by the early 19th century the village was under attack. In 1822 the village comprised the church and around 30 houses; thirty years later only a handful of houses and the foundations of the church remained and by 1912 all these had gone. The place itself has a special interest, telling, so to speak, its own history—a history of desolation. The wife, pointing to the road passing between the house and the beach, told me she remembered Kilnsea church standing at the seaward end of the village, with as broad a road between it and the edge of the cliff. But year by year, as from time immemorial the sea advanced, the road, fields, pastures, and cottages were undermined and melted away. Still the church stood, and though it trembled as the roaring waves smote the cliff beneath, and the wind howled around its unsheltered walls, service was held within it up to 1823. In that year it began to yield, the walls cracked, the floor sank, the windows broke; sea-birds flew in and out, shrieking in the storm, until, in 1826, one-half of the edifice tumbled into the sea, and the other half followed in 1831. The chief portion of the village stands on and near the cliff, but as the waste appears to be greater there than elsewhere, houses are abandoned year by year. Kilnsea exists, therefore, only as a diminished and diminishing parish, and in the few scattered cottages near the bank of the Humber. The old font was carried away from the church to Skeffling, where it is preserved in the garden of the parsonage. When the weather did permit, the faithful were called to their improvised place of worship by the church bell which was suspended from a beam in a stack yard and struck by throwing stones at it. Even though Kilnsea has resettled itself to the west it is still being chased further inland by flooding and by the sea. I hope that despite last night’s depredations everyone at risk anywhere along the coast kept safe. As I’ve spent the week on tenterhooks waiting to see if the offer on the French house is accepted it’s been a bit of a struggle to settle back to the editing work so I shuffled off to one of my favourite places along the coast, Spurn Point. It was cold and cloudy and I forgot my camera so when I happened upon a weird object in the middle of a field I was a tad miffed with myself. Having almost decided that the denizens of the little village of Kilnsea (next door to Spurn) were not indulging in arcane rites and rituals involving whopping great lumps of concrete I needed to know more. A pleasant lunchtime chat with coffee in one hand and sandwich in t’other led to the disclosure of the area’s WWI history and this morning I’ll share some of it with you. 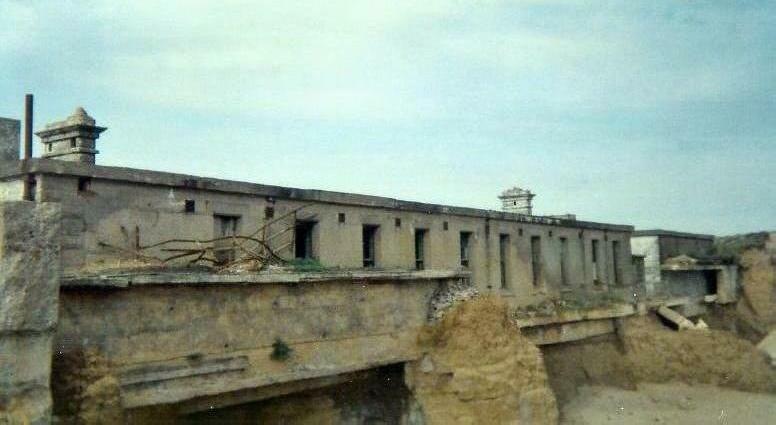 The quiet village of Kilnsea was invaded by the military who built Fort Godwin there and what is now the wild nature reserve of Spurn Point was armed with three gun batteries and a signal station. All ships approaching the coast and the Humber estuary used a combination of lights, pennants and sound to show they were friendly. 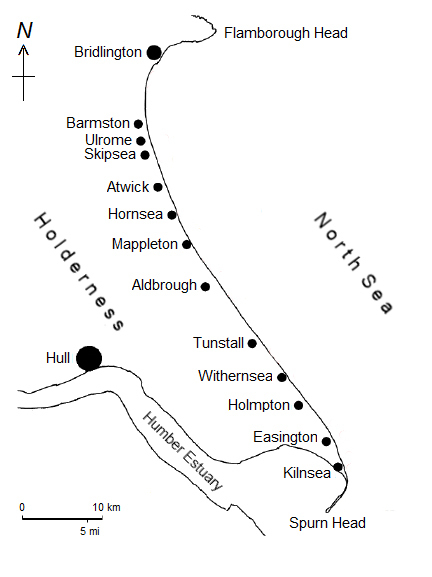 A railway was built to link the installations on Spurn with those at Kilnsea. 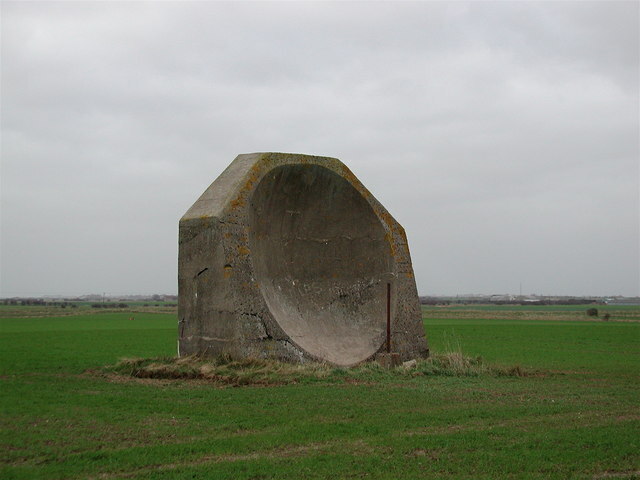 Perhaps the most intriguing military installation was that of a sound mirror – a huge concrete dish designed to pick up the sound of incoming enemy aircraft flying over the North Sea. So the mystery of the concrete lump was solved and no, the good folk of Kilnsea do not participate in idolatrous practices (to the best of my knowledge). The Mirror works by capturing and concentrating sound waves from approaching aircraft (Zeppelins in Kilnsea’s case) via a microphone. Eventually, it was superseded by its big brother radar. The photo shows the mirror with the remains of the pipe for holding the microphone. The Kilnsea mirror is around 4.5m high and is said to have provided three or four minutes of extra warning before the attack. That doesn’t sound much to me but what do I know? Perhaps it was sufficient for the searchlights and gun batteries to gear up for action – although all the military defences on the coast were unable to fend off a Zeppelin attack in 1915 when it offloaded its bombs on the ports of Hull and Grimsby further down the coast, with 60 casualties recorded. 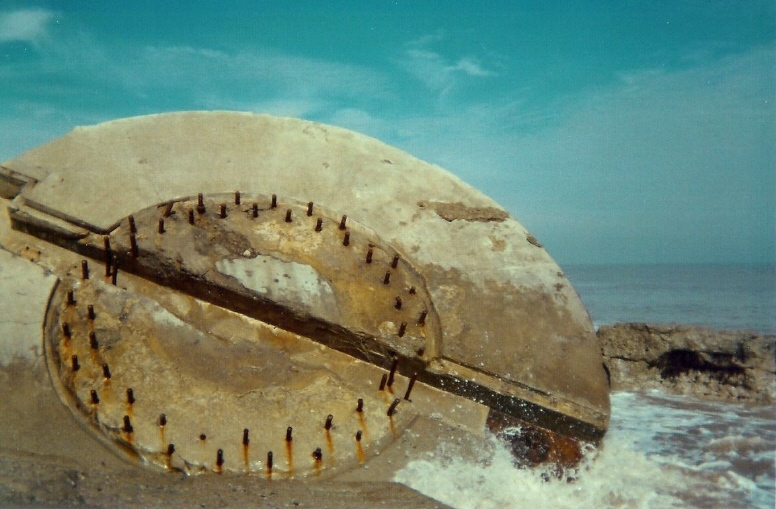 Today much of the WWI installations like Fort Godwin (photos below) have tumbled down the cliffs onto the beaches however the Kilnsea Sound mirror is now a monument protected by English Heritage. Thanks to urbanrim.org.uk and Paul Glazzard for the photos.